The Christmas-before-last, a friend sent me a fantastic 3-D Christmas Cookie kit….only, it arrived after Christmas, so I didn’t get a chance to use it. Last year (I keep wanting to say “this year”! ), knowing it was my turn to host our weekly Yoga Mums catch-up just before Christmas, I knew I had to give it a try. Cream butter and sugar until light and fluffy. Add eggs, vanilla and salt, and beat well. Mix in flour; combine to form a dough. Split the mixture in half and form into balls; wrap each in cling film and refrigerate for one hour. Preheat oven to 180degC. Line baking trays with baking paper. On a lightly floured board, roll dough out to 3-4mm thick. Cut desired shapes, place on trays and bake for 12 minutes, or until golden and firm. Cool on trays for 10 minutes before transferring to wire racks to cool completely. Beat together 2 egg whites, 1 t lemon juice, and enough icing sugar (maybe 200g?) to form a stiff mixture. Add food colouring if desired, and loosen with a little water if you have trouble spreading it. I piped the edges of the cookies, then flooded the inners, spreading with a spoon; the piped edges meant that the shape was maintained. Add decoration of your choice – I used silver cachous. Leave the cookies to set for a minimum of three hours…not like me, who ran out of time and had to stack ’em before they were set. They still tasted good, but the bottom stars didn’t look so pretty. Ooooooh, and I’m very excited to announce that beginning February, I’ll be hosting a weekly linky called “Fun with Food”! Join in the fun every Tuesday (or any time during the week, really), and share your kitchen (mis)adventures with everyone. I’m hoping to be inspired by what’s happening in the heart of other people’s homes. There’ll be a fancy button and everything…once I get my head around how it all works! 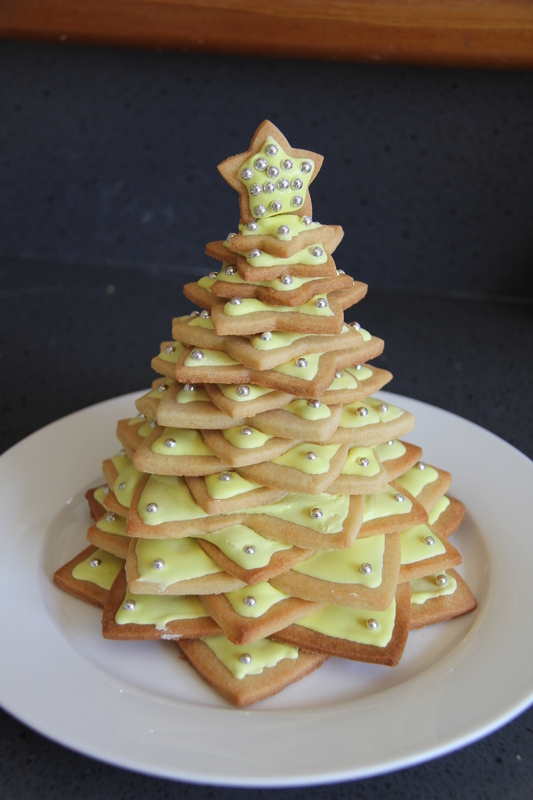 This entry was posted in Baking, Biscuits, Christmas, Fun with Food by Ange - Tall, Short, Tiny & a Pickle. Bookmark the permalink. I loved these when I saw them before Christmas (on FB?!) – they look so professional! Yay for you hosting a linky – I’m sure I’ll be able to link up a few fun recipes along the way! looks amazing! i saw one of these made up before christmas and was going to be mounted on the christmas tree… stunning! oooh the fun with food sounds fun – and i need excuses to try new things or be more adventurous, or just make scrummy good as i’m gluten/egg/diary/nut free (amoungst other things…) i’ll be watchng out and seeing how i can join in!